Are you as sick of seeing all those lame ads on the side of buses as we are? Our new favorite is “The perfect trip … The perfect trap” slogan for “The Tourist.” Like, really? Though we probably will see it if for nothing but to satisfy the superficial drive of our existence … Johnny Depp AND Angelina Jolie, ’nuff said. But now we are digressing, back to lame bus ads. In March, something worth some real thought will finally be placed on the side of an AC Transit bus: artwork by students from Berkeley High’s Arts and Humanities Academy. The bus, specifically, will be the Freedom Bus, a collaboration between AC Transit and Alameda County Office of Education. It marks the 55th anniversary of Rosa Parks’ refusal to get up during the infamous bus ride in Montgomery, Alabama. 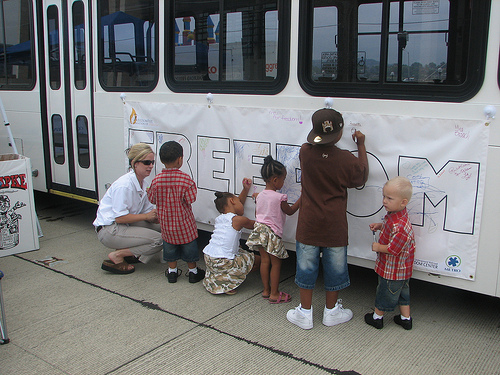 Kids from Alameda and Contra Costa school districts are competing to have their art chosen for the Freedom Bus. The art competition helps educate children about civil rights movements. Until then, I guess we’ll just have to put up with Johnny and Angelina.